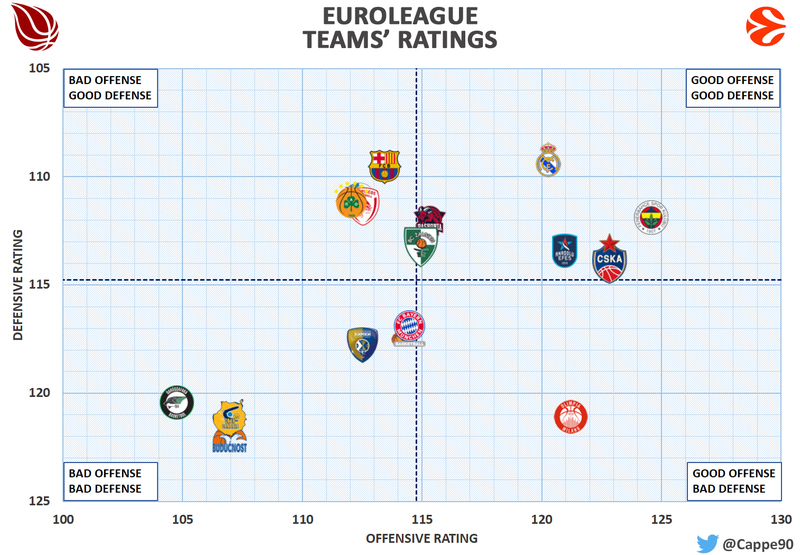 Let's see some numbers of the Euroleague's regular season. Welcome back to Corner Stats! 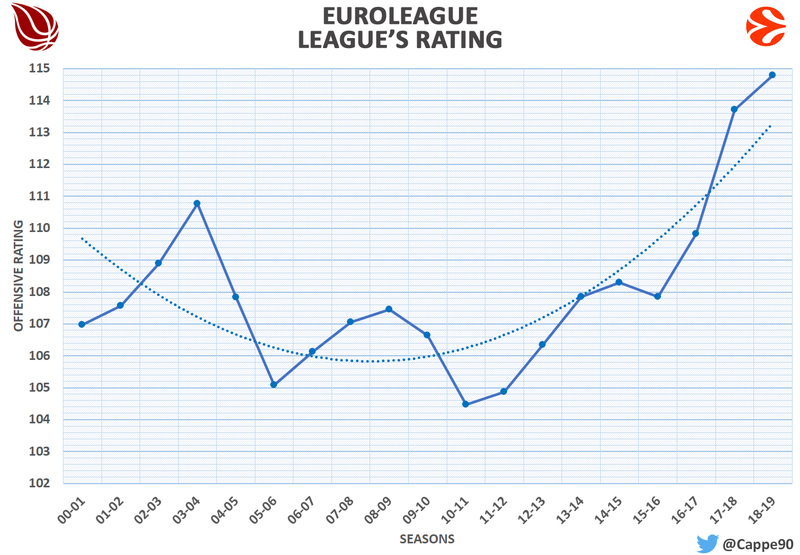 Since the EuroLeague regular season has ended, let’s look at some numbers to understand how the season was. At the end of the season, we can confirm it: the League Rating was around 115, becoming the highest value ever seen in the last 20 years of EuroLeague. This data shows how the general quality of the game has increased in recent years, thanks to the new format. There is, however, to consider how even the normal evolution of the game has influenced the playstyle. That said, let us return to the first chart: in the upper right corner, we can find the first four teams in the standing. It’s not a causality. It is also interesting to note how, apart from Olympiacos and Maccabi, teams with a Defensive Rating below the League average did not get a playoff spot. Milan is then a unique case: it is rare to find a team with such a high value of Offensive Rating not being able to have a defense at least near the league average. The defense is clearly the factor that excluded Olimpia from the playoffs (in the last 6 games, the most decisive ones, Milan’s Defensive Rating was 129). The Zalgiris, on the other hand, who seemed to be out of the game on round 24, took the eighth place with an exciting ride: this is a masterpiece by Jasi because compared to last season he has a team with a lower quality than the last one. In the last six games, the Kaunas team has had a 6-0 record (with important and decisive won games, like Real and Olympiacos) and has averaged an Offensive Rating of 124.5 and a Defensive Rating of 105. In other words, it would be in the upper right corner of the rating chart. If the Zalgiris can laugh, there is a team that is crying. Olympiacos was one of the teams that generated more hype during the summer construction and collapsed during the season. It has been ruled by a structural problem undervalued during the summer: having relied too much on Spanoulis’creations. The Greek star is one of the most victorious players in recent history, but in the last seasons had shown signs of tiredness. This year he has averaged a 100 in Offensive Rating (league average 102) and a Defensive Rating of 115 (league average 115). The problem is that without Spanoulis on the court, the offensive performance of the team worsens: according to the Overbasket data (which uses different calculation than mine) Olympiacos’Offensive Rating was 96.3. With Spanoulis on the bench, the value dropped to 92.6, while with the Greek star on the field it rises to 99.8. This denotes that without its leader, Olympiacos’attack assumed the worst value among all the teams, while it remained around the league average with him on the court. Spanoulis shot 44% from 2, 33% from 3 and averaged an Ast / TO of 1,8. Numbers that are far from those ideals for a leader of a team that aspires to the playoffs. On the other side of Athens, a party takes place: led by an unreal Calathes, Panathinaikos has snatched a playoff spot: in the last six rounds, it has won five games (including some decisive ones like the one with Milan or Baskonia); during this period it averaged an Offensive Rating of 113 and a Defensive Rating of 100. In particular, Calathes is among the best for VORP (fifth) and ended the season with a triple-double. So, now it is playoff time: in my opinion, there will not be too many problems for Fenerbahce and CSKA; for Real, it will be necessary to understand how bad is Llull’s injury. In any case, given the mental and physical condition and experience of Panathinaikos, the challenge is more open than one might think. And in conclusion, the quarter-final with most doubts about the winner: Efes and Barcelona are two excellent teams, complete and well trained. Due to the home advantage, the Turkish team has more chances to win, but it is that this quarter-final is the most balanced and intriguing. We’ll see.